Health & Fitness Week: A Bit On The Side…. Yes, yes, I know in theory we are supposed to get all we need in the way of minerals, vitamins and nutrients from our diet. The right food choices should give us the full complement of all our body’s requirements for every day life. But what if you’re putting your body through extra stress and strain on a new training programme? Check. Or you’re limiting your calories? Check. Or just trying to boost your body’s resources.? Check. I’m no nutritionist or health professional, but I thought I might jot down what I take and why. 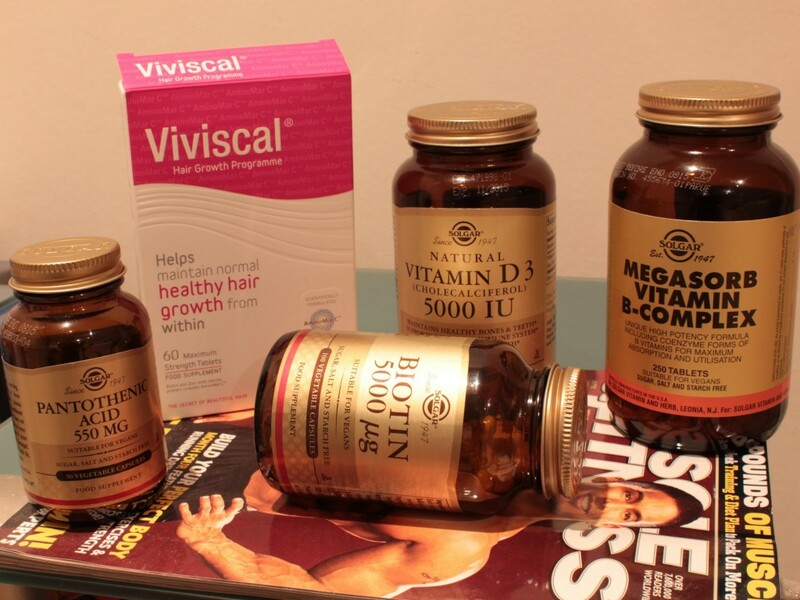 (Luckily for me, Mr H is big on fitness and nutrition, so most of what I take has been researched and sourced by him.) 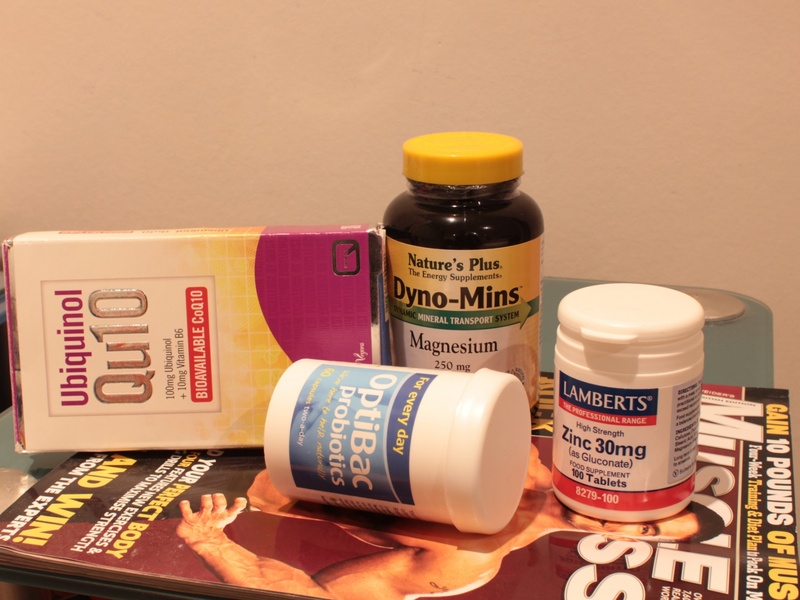 Hopefully it might help you a bit, but make sure to check with your doctor before buying or taking any of these – case in point – my mother was about to start taking the hair supplement that’s done wonders for me, but when she checked with her doctor, she was told she couldn’t because of the iron content. So what works for me might not work for you. It’s worth checking out what your needs are, where you’re lacking and where you might benefit from supplementation, if at all. 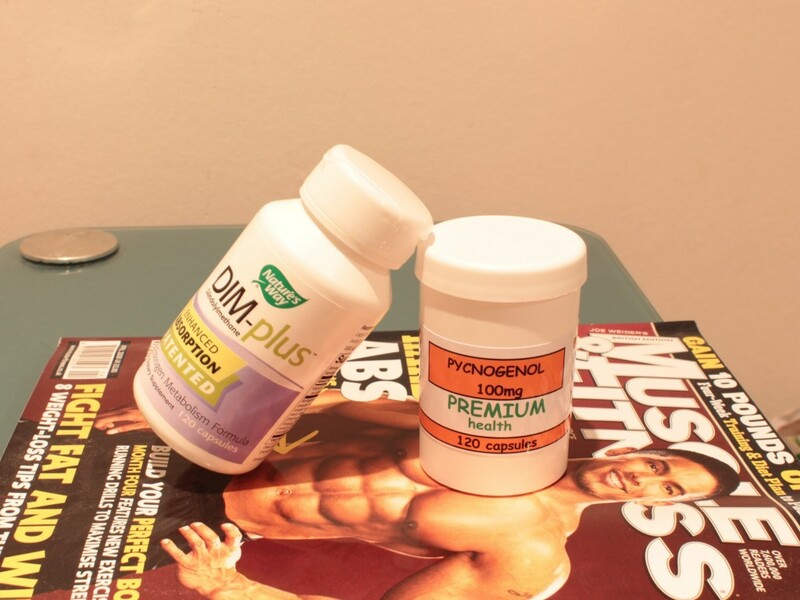 Google everything for more information on the benefits of each supplement – they are far too numerous for me to go into full detail here, but double check your findings with a professional – Google can get it so wrong and there’s nothing worse than the wrong self-diagnosis! And before I get loads of comments below, yes, I do take an inordinate amount of supplements, and it’s something I’m working on streamlining, but for now, here’s how it stands….! Probiotics: Since the new year, I’ve resolved to take a week’s course of probiotics once a month, just to keep everything ticking over nicely. Especially important for me at the moment as I’ve just had two courses of strong antibiotics over the Christmas period, which has really sent me reeling, but it’s something I intend to keep going. Zinc: boosts immune system, improves cardiovascular health and is a super antioxidant. Magnesium: Helps to maintain bones and the nervous system, as well as muscle function, inlcuding the heart. It’s also known to help reduce tiredness and fatigue. I’ve definitely been sleeping better since starting on this. Ubiquinol Qu10: For the last month, I’ve been trialling this one-a-day supplement to see if it lives up to it’s claims that it helps to help combat fatigue and I’m pleased to report that I really think it’s made a difference! It definitely helped me through the two weeks of hellish illness when I went from one infection to another (and then again onto another!) and I honestly don’t think my recovery would have been as swift without these. I’m not sure I need to add yet another supplement to my huge stash on an ongoing basis, but this is definitely something I would come back to when I’m beginning to feel run down. Imedeen: One of my two all time faves is Imedeen. It’s is not easy on the purse strings, but it’s had beauty editors raving about it foreverrrrrr. It’s worth booking a Dermascan to get your skin “read” before you start taking it and then again after a few months, just to check on the difference it makes to you – sometimes it’s the changes underneath the surface that you can’t see that will do you more favours in the long run than the changes immediately visible to the naked eye. 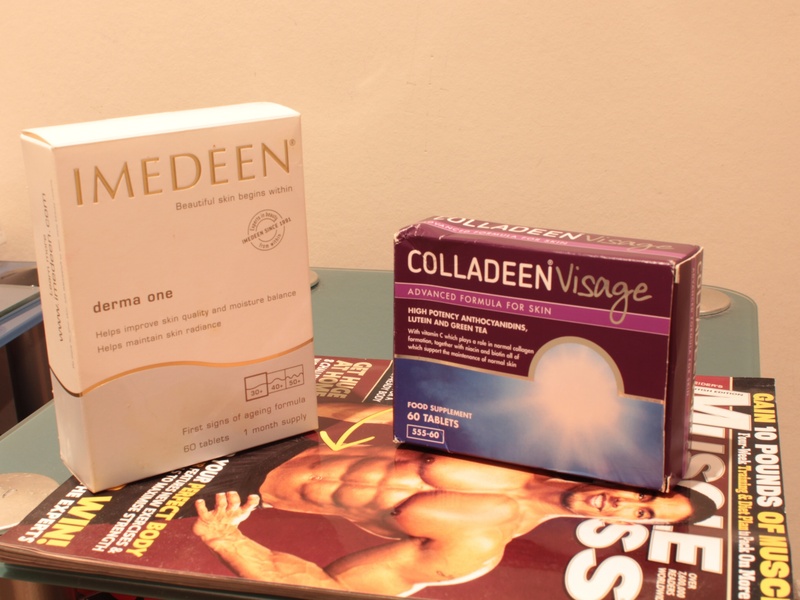 Imedeen promises to work on the dermal layer, under the skin’s surface, where ageing normally starts before you can even see the effects on the surface. If you’re serious about your daily skincare, you’ll love this! Colladeen Visage: I took this a while ago, and I swear I could see the difference it made to the my skin! I first wrote about it here, but in essence, this works on reducing the depth of wrinkles on the surface of the skin, increasing the skin’s elasticity and interestingly, increasing the skin’s natural defence against sun damage, with an average SPF 10 after 12 weeks of use! 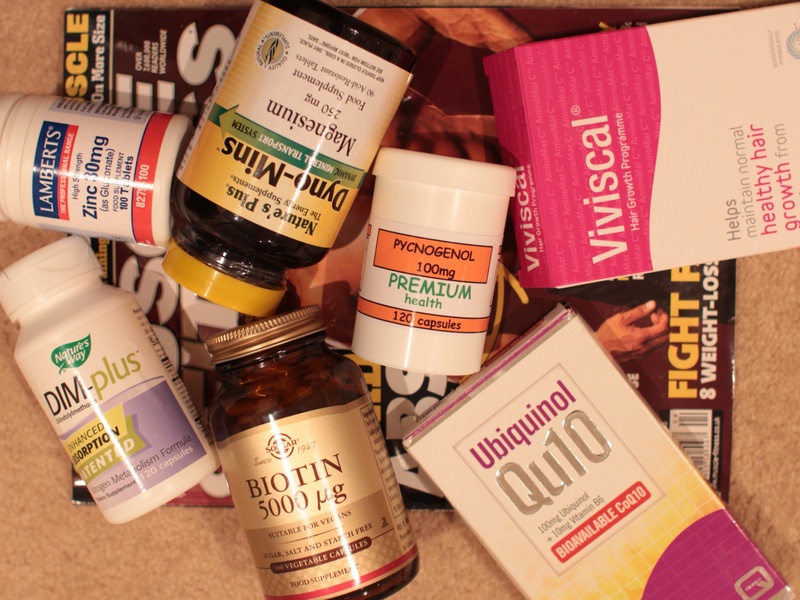 Viviscal: It’s no secret I’ve been taking Viviscal now for over 6 months and I can’t see that I’ll ever stop! I totally credit this little wonder with giving me back the hair I used to have – lots of teeny tiny little baby hairs attest to all the new growth and my hair feels stronger, fuller and less brittle. Starting off with two tablets a day (morning and night) and then dropping down to one a day after around four months, it’s definitely worth a try if your hair is thinning or falling out. But a couple of caveats: check the full list of ingredients in case there’s anything you should be talking (my mother can’t take this as it provides too much iron for her) and bear in mind this is not suitable for vegetarians – pescatarians, however, you’re good to go! Pycogenol: this is a pine-bark extract, loaded with bioflavonoids, that mops up aggressive radicals, strengthens blood vessel walls and capillaries and protects against cramp! Dim-plus: packed full of a phytonutrient found in cruicferous vegetables including broccoli, sprouts & cabbage, this has hormonal benefits, supporting the activity of enzymes that improve oestrogen metabolism. Calcium Glucarate: made up of calcium and glucaric acid, this supplement is thought to decrease the body’s levels of oestrogen. Broccoli Sprouts: another anti-oestrogenic supplement, also said to provide powerful free-radical protection for the CV system and for cells and tissues in the body. Any questions? You can tweet me @AmbarinaHasan, or leave me a comment below, and I’ll do my best to get back to you.